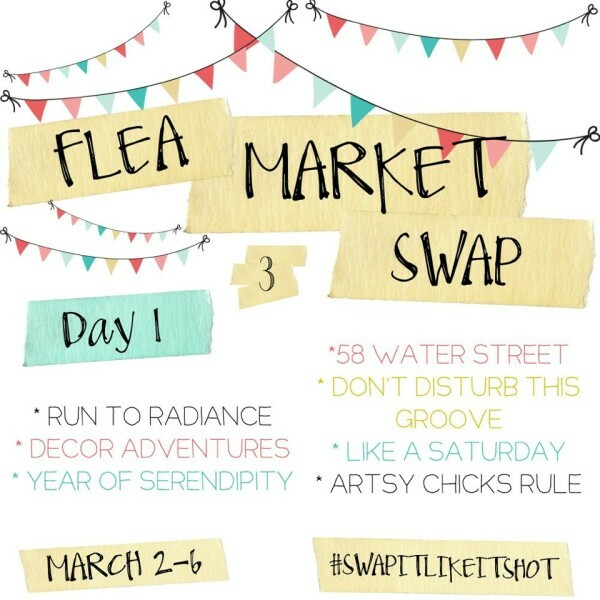 Today is the first day of the “Swap it Like it’s Hot” Challenge. 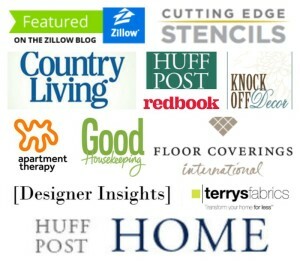 I’m so excited to be participating in this fun week of thrifty makeovers with 33 bloggers in total. If you’ve been around awhile or have read any of my posts here on the blog, you know thrifting is my thing. 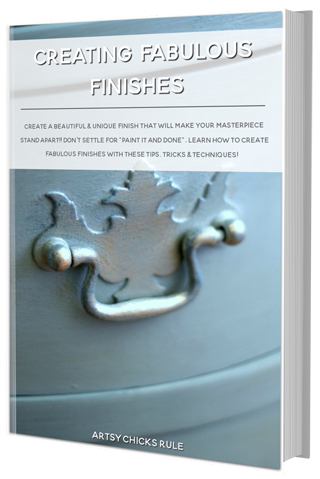 There are treasures galore out there and it’s the best budget friendly way to decorate your home. You just never know what you’re going to come across either. That’s the really fun part, the “treasure hunting”. Sadly, the thing is, most of these great items are easily overlooked. I totally get that. BUT I’m hoping that once you’ve finished seeing everyone’s makeovers this week, you will look a little deeper at the things you come across out there. Look past how they appear sitting on the shelf and see what they can be. They are diamonds in the rough, I tell ya! Like these items that Rachel from Like a Saturday sent me. What to do with that?? Vintage 70’s love right there. I had considered spray painting the juice glasses and using them for my makeup brushes. Or pens/pencils or paint brushes. But I instead decided to go a bit further than that. 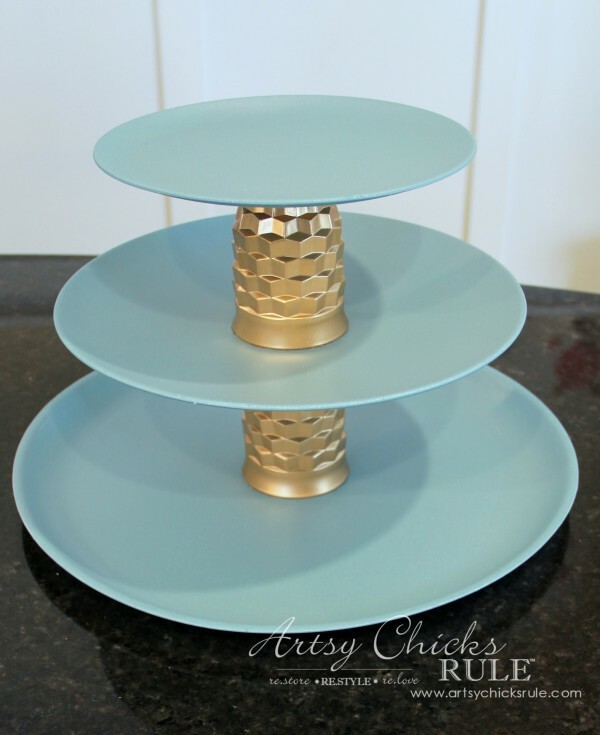 A pretty three tiered tray. Perfect spot for my jewelry! Aren’t those glasses pretty in the gold? Yes, they are. I used this gold spray paint for those. 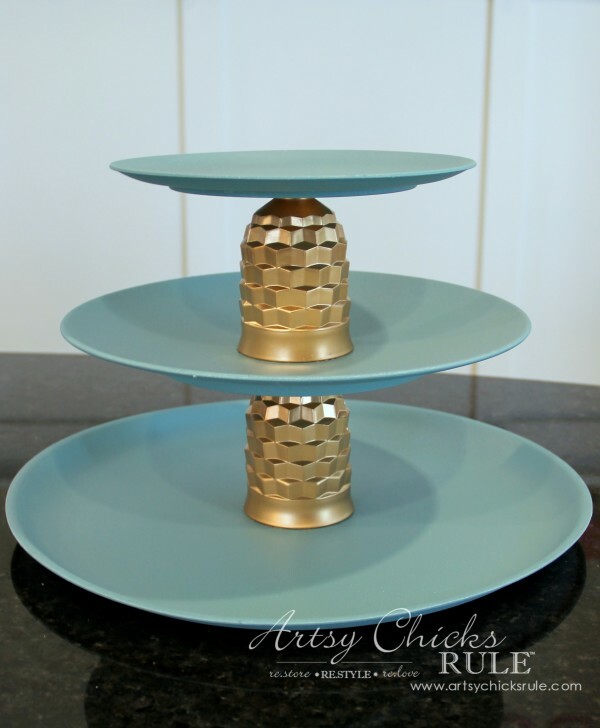 I had some old plastic plates that were perfect for the tiers. 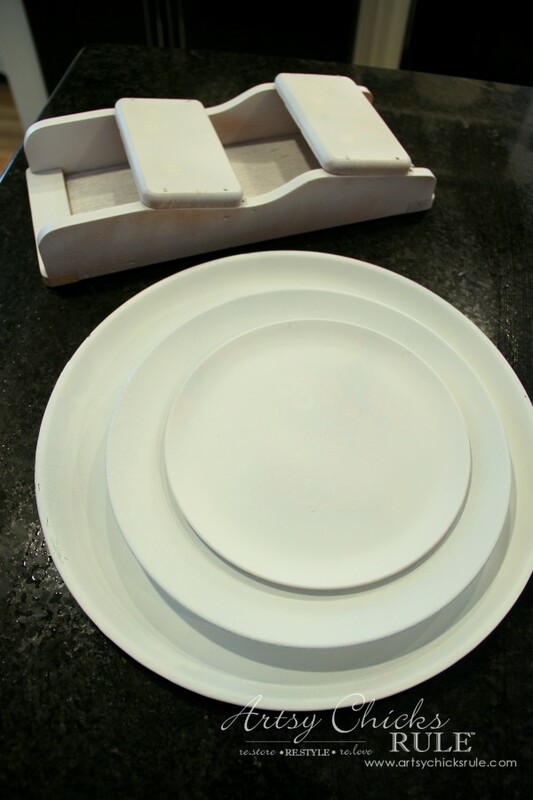 Then I painted the plates with Provence Chalk Paint (love this color!!). 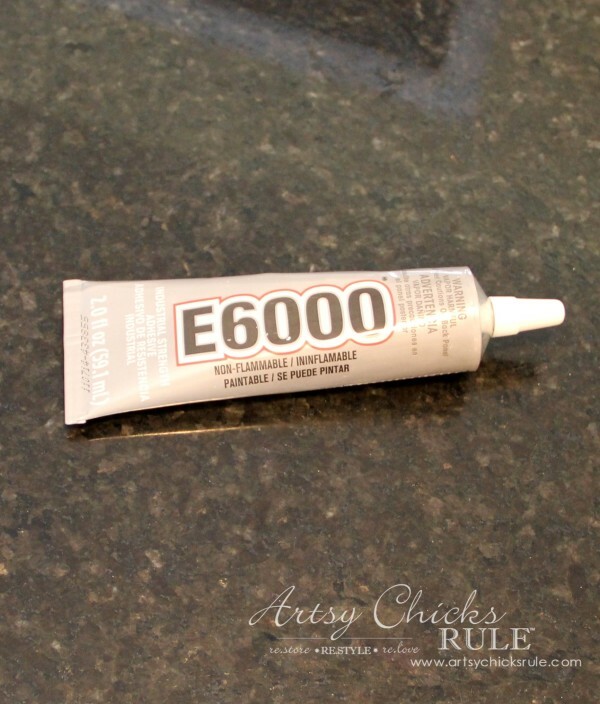 Can you see the shimmer in the top coat over the paint? It made them look spectacular! That stuff is SOLID but strong, as in chemical strong. Be sure to use it outside or in the garage so you won’t be breathing the fumes. And once that was done and dry I loaded it up! And who would ever guess those gold pretties were old green glasses before? What a great design they have too. I thought the glasses looked best upside down so glued them that way. 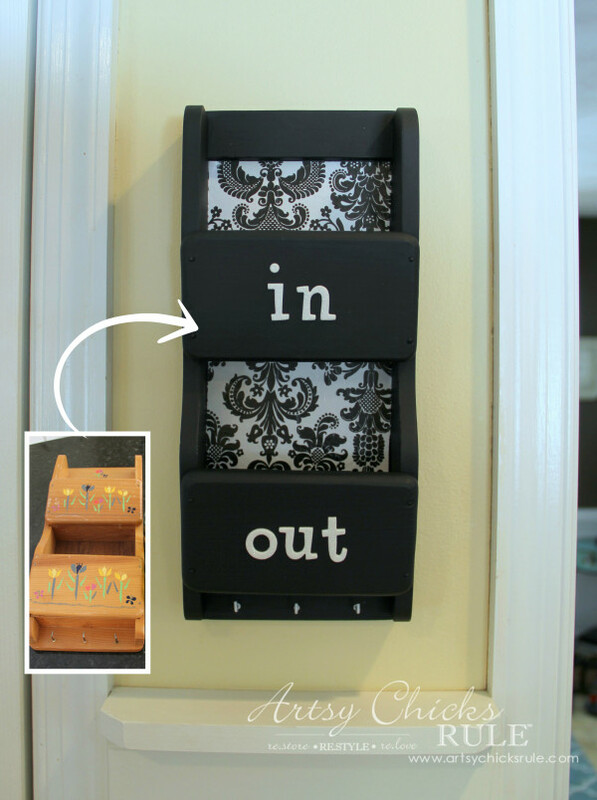 And how about the little organizer tray? I decided to Mod Podge some paper onto the insides of the back. I originally thought I’d paint the front pieces black and leave the rest white. So I just sprayed the entire thing in a flat black spray paint and added sweet little glittery letters on the front. Completely different look…and oh so easy! 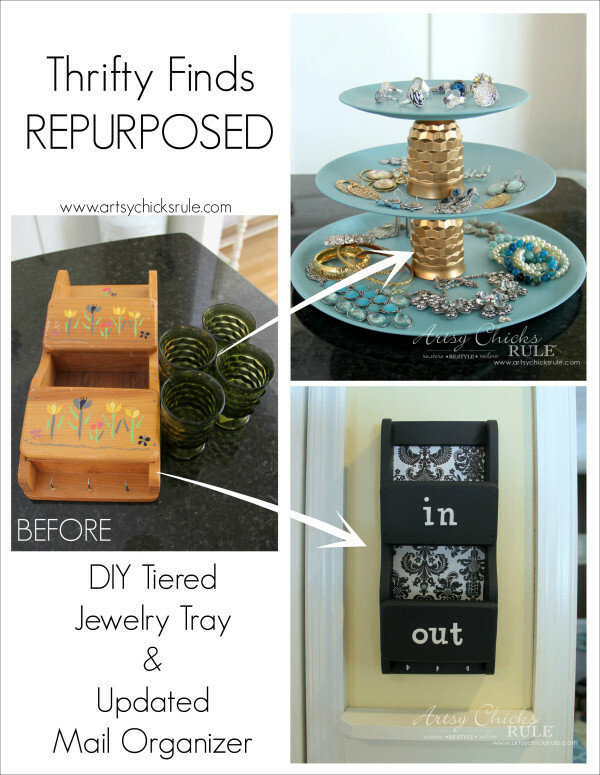 So that’s what I did with my swapped thrifty finds. I loved the challenge! 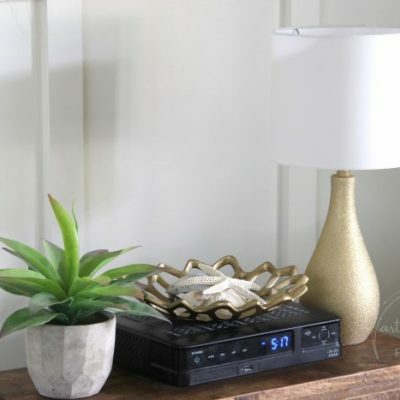 Now it’s your turn to go out and find some treasures you can recreate and repurpose too. 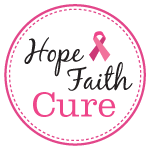 But first, be sure to visit Tania over at –> Run to Radiance to see what she did with the thrifty goodness I sent her! And check back later in the week to visit the rest of the bloggers below to see what they’ve done with theirs! Artsy Chicks Rule <– me! Good morning — I may have missed it in the article but did you mention what kind of paint you used to paint the glasses? Thanks. Sorry, I’ve edited it to add that info … Krylon Gold Metallic. Thank you very much; really enjoy your posts! 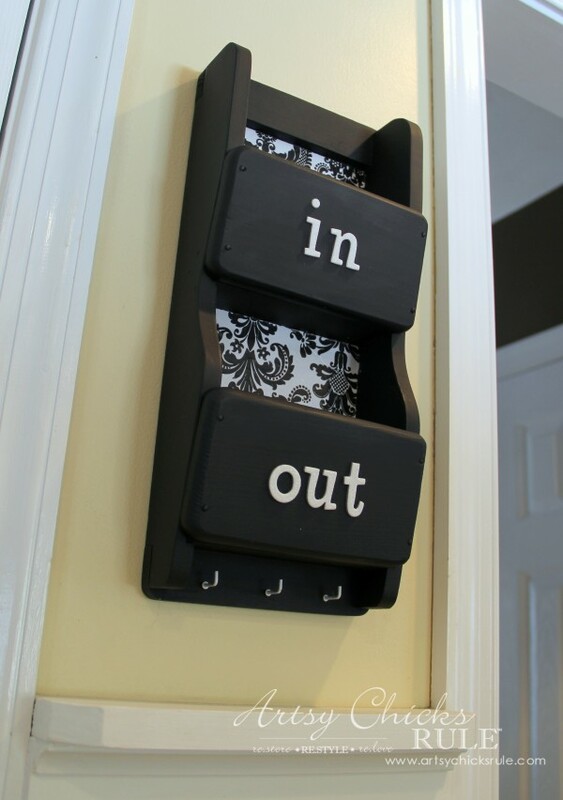 And the little in & out box is adorable. Looks so pretty!! great idea! And you got to use the mail holder too. You went all out girl! Oh yes, it’s such a rich, beautiful color! :) Thanks you! Thanks Tania!! It was fun! Absolutely love what you have done! Oh how funny Chris! And oh yes, I totally get that. I do the same when I come across things sometimes. I came across a very unique wood/iron shelf a few weeks ago that I had when I was first married. (24 years ago) and I would swear it’s the same one. But who knows! I sure did get a rush of emotion when I saw it though! Thanks so much Heather! Oh yes, it’s fabulous stuff. 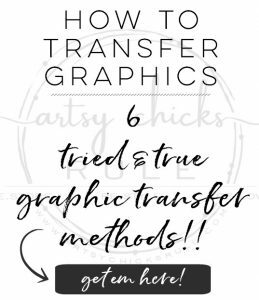 I’ve used it on a bunch of things here on the blog. Sadly, I picked it up in the clearance bin at Michaels awhile back so I’m not sure if that means it’s discontinued or not made anymore. I do love it! Love the way your mind thinks Nancy! I love each of these projects equally. I bet you totally wowed Rachel. Such pretty and clever makeovers Nancy! 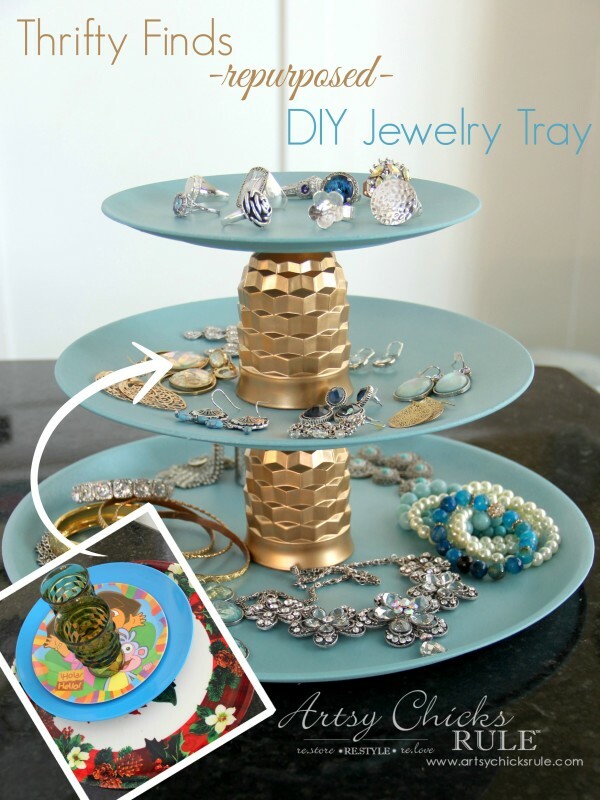 I never would have thought of that jewelry tray! Ok, Just shut the back door!!!! So stinkin cute… both your projects. I just love rescuing thrift store finds. I am going to be all over this challenge… definately will follow. Great job, Nancy. Thanks! :) It was so much fun to do….and really pushed me to think outside of the box. Love that! I have a set of footed glasses very similar to the ones that you painted that I use nearly every night. I like them so much that I also have 12 of the same glasses in amber. (All picked up at antique shops.) 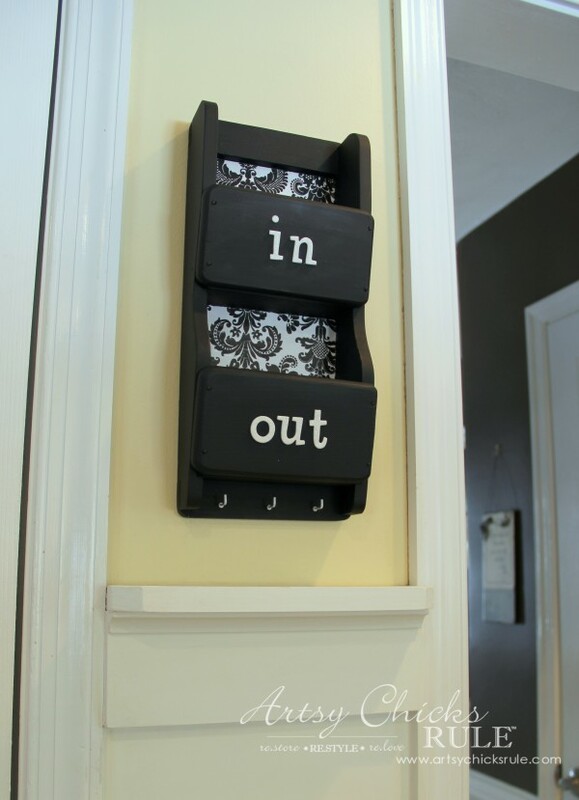 You came up with a great way to repurpose these! 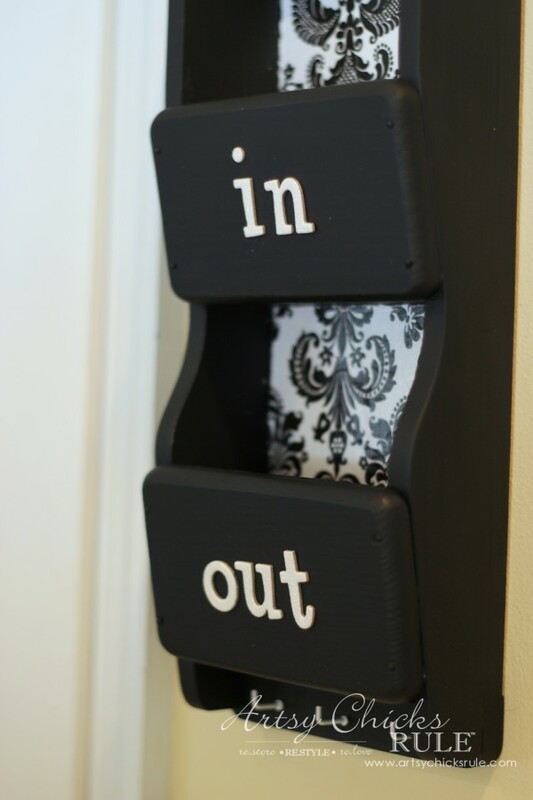 Your in and out box is great for organizing mail. I’m looking forward to browsing all of the projects this week. Please don’t paint yours. They are antique, either Depression glass or Fostoria and I am suspecting the Fostoria. Mfr has been around for ages and it can be pricey. It’s really cute but I about had another heart attack when I saw those painted. 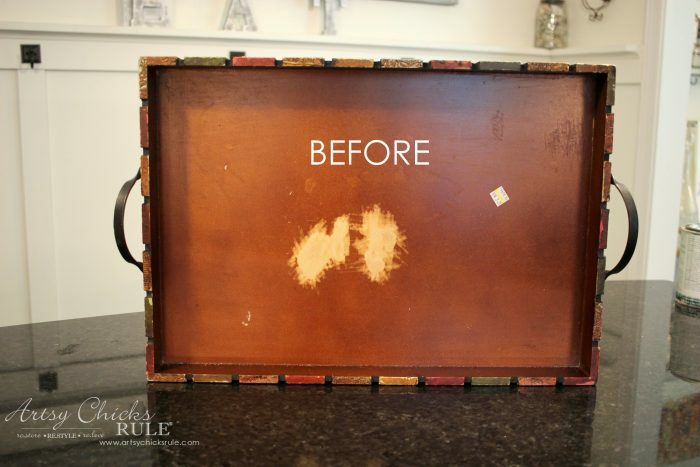 Great transformation – so creative! I’ve never painted glass before but now I’ll have to try! This is great! Those glasses look so good in gold – I wouldn’t have thought to spray paint them, but now I’m going to keep my eyes out for something similar! Nancy, love both projects!! 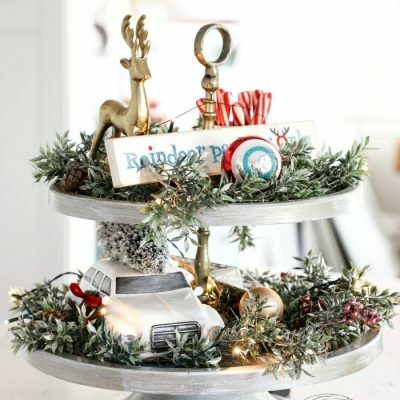 Would love to make one of the tiered trays! And both items should be easy to find! I love the mail organizer, too, but I would have to chance upon one of them! I don’t have much luck finding good stuff in my city! Thanks so much! 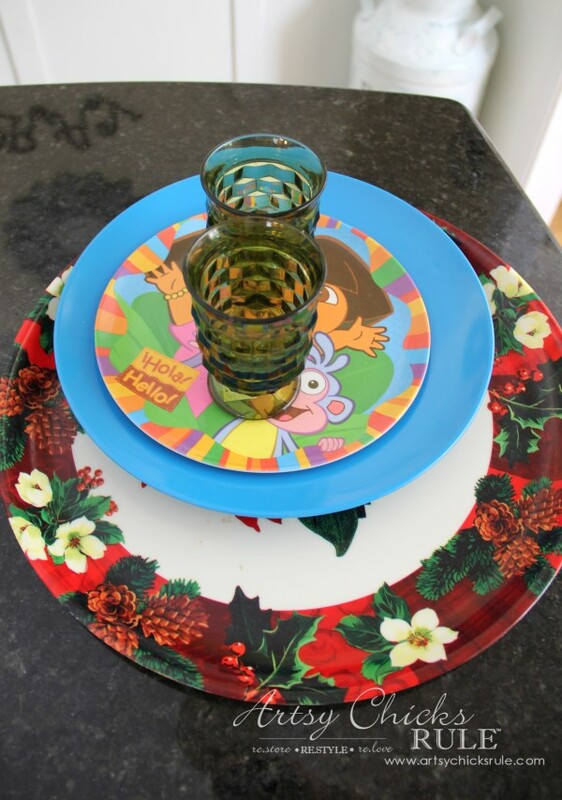 The tiered tray was fun to create! I might make more for gifts next year! 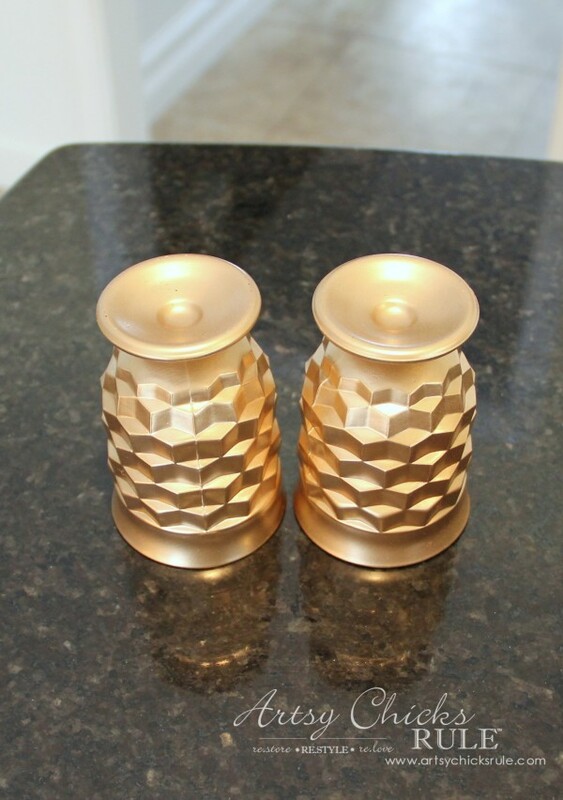 Really loving the gold, they look like pineapples!! 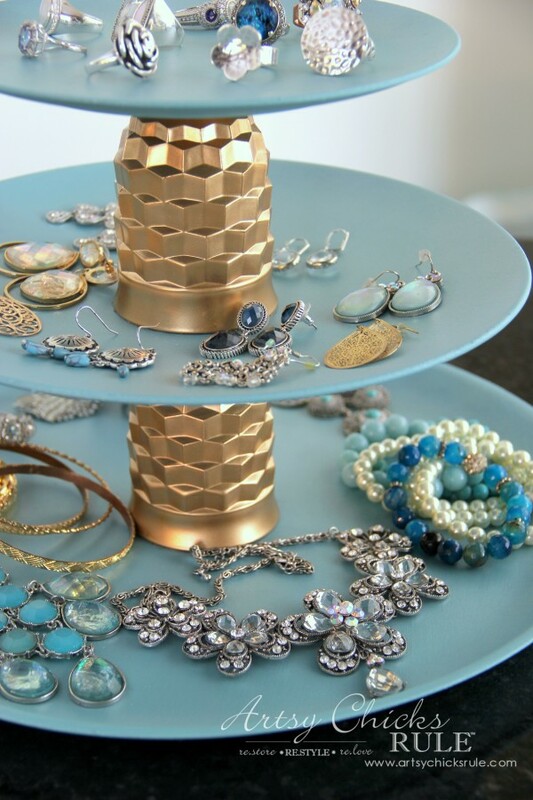 Oh Nancy, I just love your jewelry tray. It’s seriously so pretty. The colors you chose are perfect. Super cute Nancy! 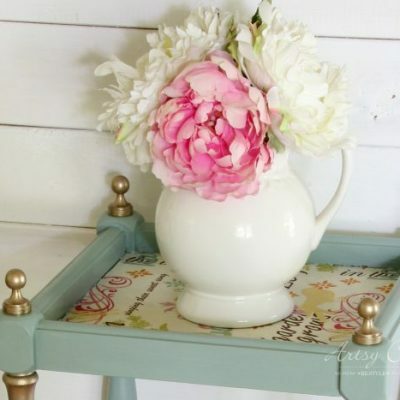 We are kindred spirits when it comes to recreating thrift store finds! How can I get in on this next time? Thank you Colleen!! :) I can give your info to the girl who organizes!! 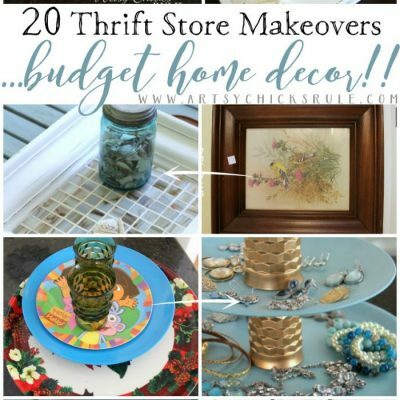 It’s been so fun to see what everyone has done with their thrift gifts. 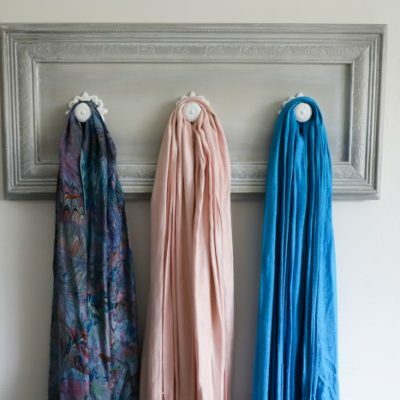 Love your new jewelry holder! 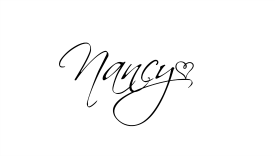 Nancy, loved your transformations! 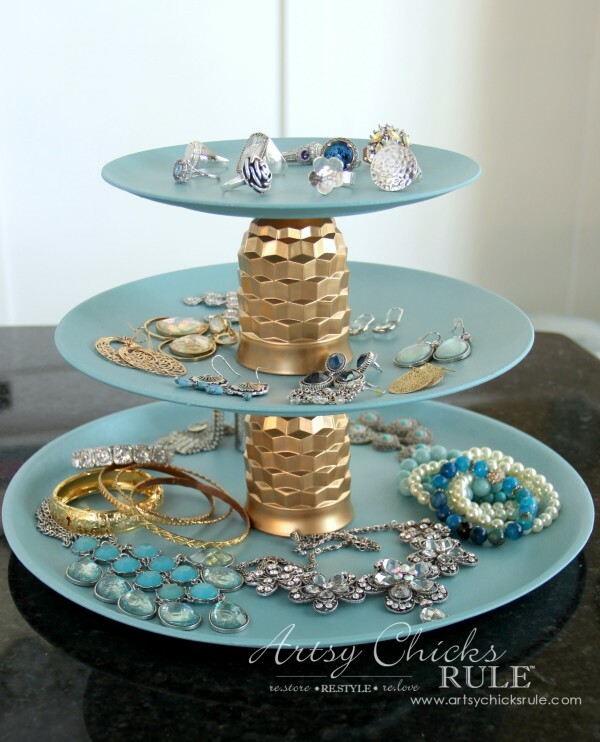 The jewelry organizer is amazing and your jewelry looks so pretty on it. This is such a great transformation, I wouldn’t have thought of that!!! And your collection of jewelry is awesome! I love both projects, I think anything that allows you to see your jewellery is great, I tend to forget what I have if I can’t see it easily. 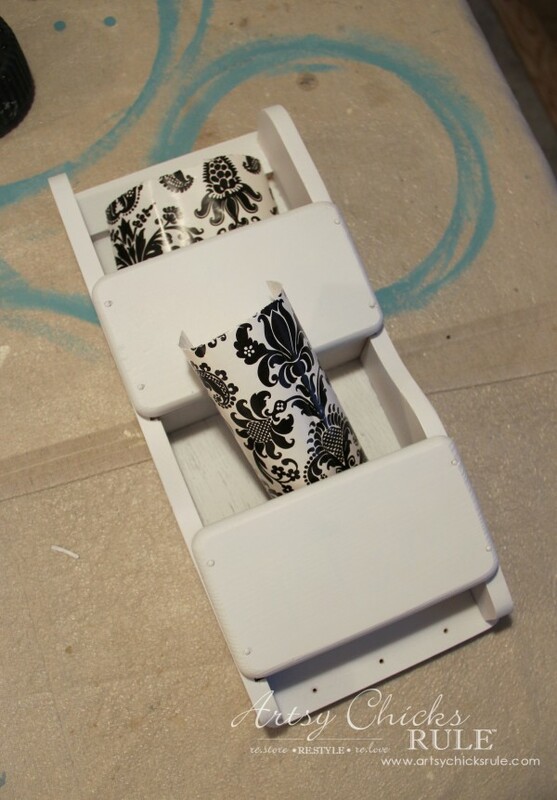 And the mail sorter – what a transformation! Very chic. Fabulous ideas!!! I love both of your creations!! Loving your jewelry! 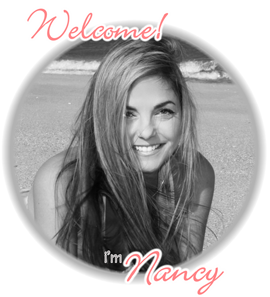 Nancy, just found your blog and love, love, love it! What a fabulous idea with the glasses. I love the gold and blue. That was really creative. Wow! I saw the before and couldn’t guess what you were working on. I would never have guessed those were those cheap plastic plates! It looks gorgeous, like an expensive jewelery holder. Great work! AWESOME!! Love both projects. Thanks for the tip with the Pearl spray paint. It’s so pretty. I would have never thought of that. Thanks for sharing ALL the detailed instructions!! Thank you Lorraine! :) Oh yes, it just gives it such a nice touch! I do so hope I can find it again when I run out. How creative you were with your swap items! 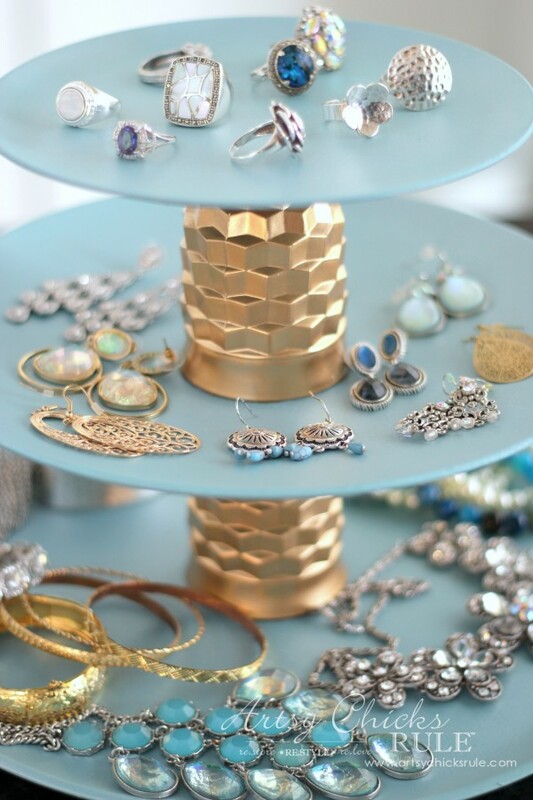 I love the blue and gold together on the jewelry display/organizer. 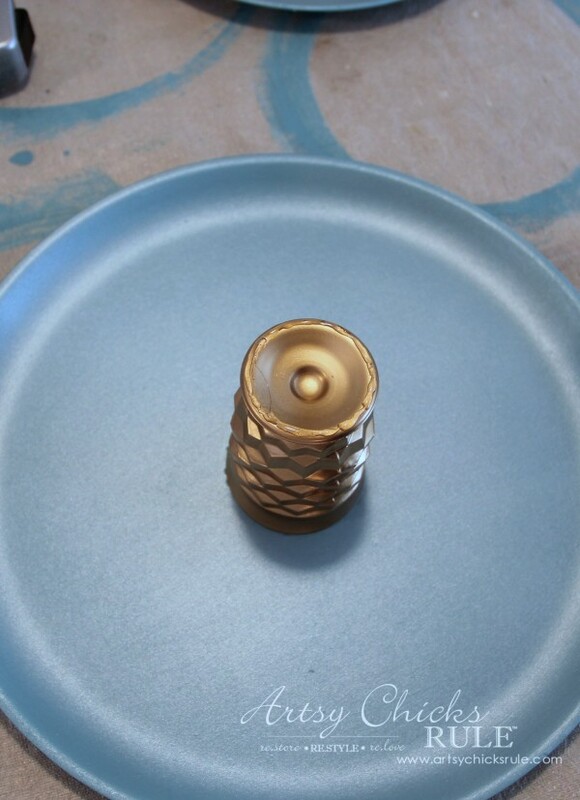 Thank you so much for linking up and linking back to My Repurposed Life’s Catch as Catch Can! Catching you this week! 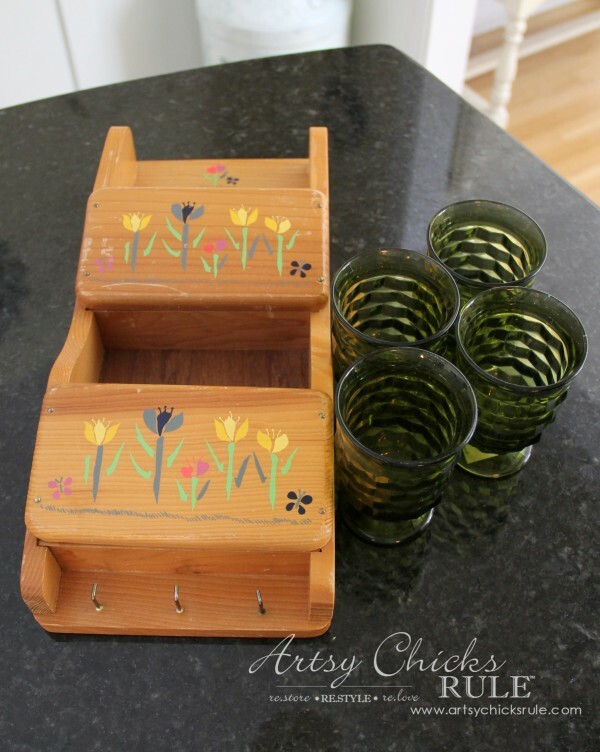 Very cute, but OMG I thi k the juice glasses are Fostoria pattern…Depression glaases..and a set of 4….. Thanks Susan! I think you are right. :) They were sent to me to makeover and I didn’t look them up…but have since. I used FolkArt Pearlcote Pearl Glaze to seal. I’m not sure it’s available any longer since I bought it on clearance at Michael’s and haven’t been able to find it again. Rustoleum has one that is similar. I think it is called Pearl Mist. 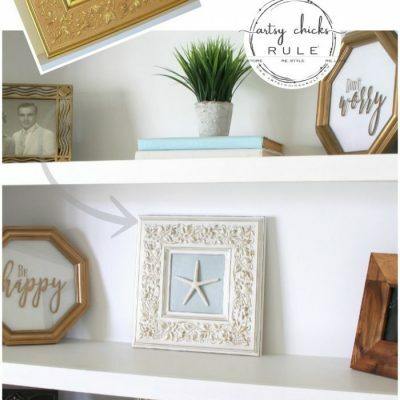 and this one…https://www.artsychicksrule.com/2015/09/robins-egg-blue-beach-box-makeover-budget-friendly-decor.html if you want to see what it looks like. What kind of brush are you using? I like Purdy brushes best. Try those. Also, try to keep a light hand as you are creating the paint strokes. Both of those things should help. 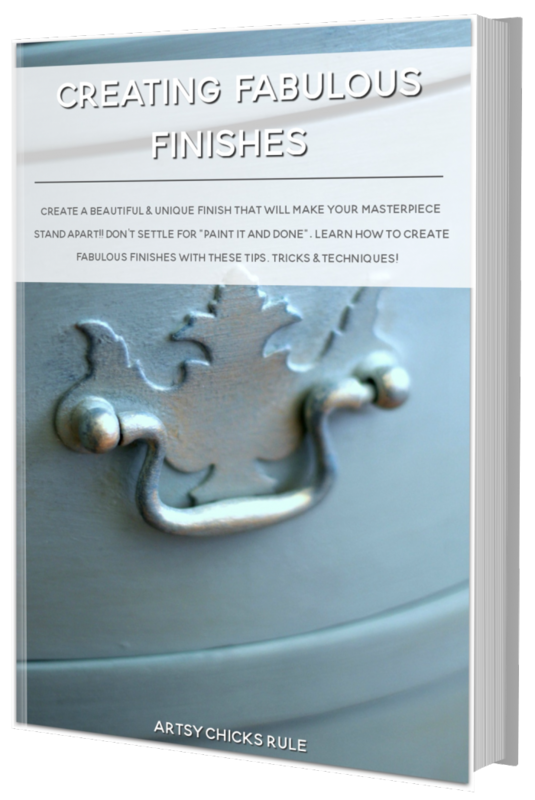 If you find that you still have some lines you can lightly sand with some very fine sandpaper before you apply your sealant. For spray painting, long, even, light strokes are best. Don’t be too close to the project or you’ll get unevenness and runs. Don’t try to cover all in one shot. It usually takes several coats, drying in between, for me. 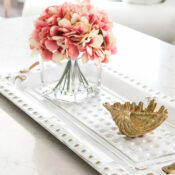 I love, love, love the jewelry tray!!!! 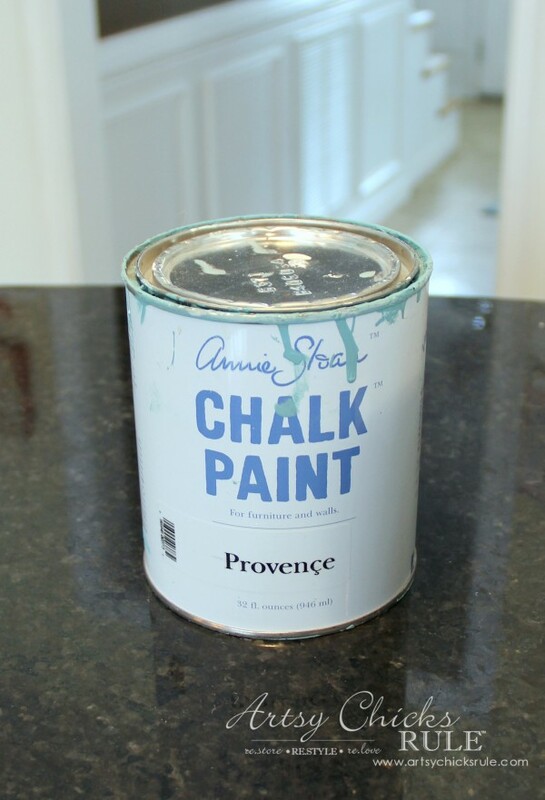 I liked that you used chalk board paint, but if you use the sealant over it, it would no longer be able to be used that way right? What do you mean? It can be used as a jewelry tray, yes. I wouldn’t recommend food, if that’s what you are referring to.